The Mozambique Shotgun is decidedly not among the best Apex Legends weapons. It sounds pretty cool on paper: it's part shotgun, part pistol, and it fires three projectiles at once. The thing is, those projectiles feel like popcorn, and I'm talking extra fluffy popcorn. Its pitiful three-round magazine doesn't help matters, and on the whole the Mozambique feels slightly less effective than delivering a stern talking-to. 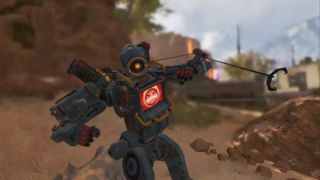 It's widely regarded as the worst gun in Apex Legends, and I don't see that changing anytime soon. Many players have asked for the Mozambique to be buffed in some way. One Reddit user asked developer Respawn Entertainment about the possibility of a Mozam-buff in a recent check-in post regarding the new Havoc energy rifle, to which senior game designer Sean Playback responded with commendable honesty: "Current plan is to keep enjoying the memes," he said, and by god are there memes. He added that "ADSing chokes the spread down which makes it easier to hit that pattern: two to the chest, one to the head." Oh, I see, the Mozambique fires in sort of an acute triangle - two low, one high. So if you scope in and aim for center mass, you might actually deal decent damage; I mean, 45 to the body and 66 to the head ain't bad. See, my mistake was thinking its shots go wherever the hell they want even if the barrel of the stupid thing is touching the freaking nostrils of the enemy rushing you with a submachine gun that you really wished you'd picked up instead. Now I understand. Playback was chock-full of factoids and pointers for other weapons too, including some viable ones. He explained that the Havoc deals up to 55 damage in beam mode, for example, and that while its beam has no travel time (making it a 'hitscan' weapon), its damage does scale down with distance. He also discussed overall weapon balance in another comment. "In general we feel like weapon balance is in pretty good shape on the live game," he said. "We're not going to be pushing balance changes very often, but when we do, our goal is that you feel it in a cool, meta-shuffling way." In other words, don't invest in Mozambique stock.